This week I started a one year sabbatical. Unlike some jobs, and contrary to popular fantasy, this does not mean a one year holiday from work. Basically, it just means that I can reduce my work week from 60 hours to 35 or 40 hours – or at least I’m going to try. It also means that I can work at home a lot of days, saving myself the 1.5 to 2 h round trip commute. So what am I going to do with all this free time? Well, in anticipation of this sabbatical I decided to take up the violin – or to be perfectly precise about it – the fiddle. I’ve been at it for about six weeks now, so ya… I am barely getting started. So far it has been exhilarating, comical, challenging and downright irritating. In fact, I now realize that I have embarked on an odyssey that will likely last years. So naturally, I thought I’d better document the experience. For those of you thinking of taking on the same challenge, perhaps this will give you an idea of what you’d be getting into. For the rest of you, take it as an opportunity to laugh at me – especially if you are an experienced musician. Embarrassment seems to go hand-in-hand with learning to play this instrument. It’s basically the same instrument – the setup is just slightly different. For example, a fiddle typically has steel strings whereas a violin would have gut strings (synthetic or natural) or composite strings (where the ‘gut’ of the heavier strings are wrapped in steel). Another difference is that the tailpiece on a fiddle usually has fine tuning screws on all four strings – whereas the violin typically would have a fine tuning screw on the finest (highest) string only. In some cases the fiddle’s bridge may be modified a bit to set up the strings a bit lower, too. However, according to most of the fiddlers I have met so far, the primary difference between the fiddle and the violin is actually in the nature of the musician. Fiddlers generally seem to consider violinists as stuff-shirted, snobby and overly serious people with a pickle up their… well, let’s say, they’re people who hold and play the instrument is a very fussy and particular way. Apparently they never drink and never have any fun either. Fiddlers on the other hand are easy-going, fun-loving people who hold the fiddle and the bow in whatever way feels comfortable and who are generally enormously likeable and entertaining. only the tip of the thumb should touch the bow. How tight should you tighten the bow? This one is easy – I’ve asked a half dozen fiddlers and only needed about fifty YouTube videos for this. They’re all perfectly consistent on it. Apparently you just tighten it “enough”. Yep, very helpful… The idea is that you want it tight enough so that the stick doesn’t mash onto the hairs when your “fiddling hard”. But you don’t want to get it too tight – or else the bow will bounce along on your strings. Right now I am able to mash and bounce simultaneously… I guess we’ll come back to this in the future, too. I started out with a student rental violin (just rehaired) and fooled around with it for a few weeks before I finally found a teacher. I had asked the guy at the shop how much rosin to put on the bow and he told me my teacher would explain all that. So I used the rosin sparingly until I got to my first lesson. There I found out that I had virtually no rosin on the bow – making it impossible to play. No wonder I was getting nowhere on my own! Apparently you need to get it sticky enough for the hair to grab the strings. Well – if a little is good, a lot must be great – so I went home and rosined that sucker to the hilt. And when I bought my own fiddle and new bow a few weeks later, the guy in the store told me that I’d have my work cut out for me for a little while to get enough rosin built up on the strings and bow for it to work well. So I rosined that one up really well, too. He also said something about how to clean the strings – but I figured that was something you did when you were going out for the evening with it. You know, so it would look nice… Obviously irrelevant for now. So I rosined the bow two or three times a practice. I rosined it in the middle of my lessons. I even spent an evening in front of the TV rosining the bow. Not playing, mind you – just a good solid hour of rosining. I tried not to blush too brightly as he showed me how to clean the strings. I nodded dutifully as he told me again that “less is more”. The other patrons and store staff tried not to laugh. I mumbled my thank-you’s, collected my fiddle and bow, and hustled out the door. I don’t know how they contained their guffaws of laughter until I made my escape. Obviously they were all fiddlers, not violinists. 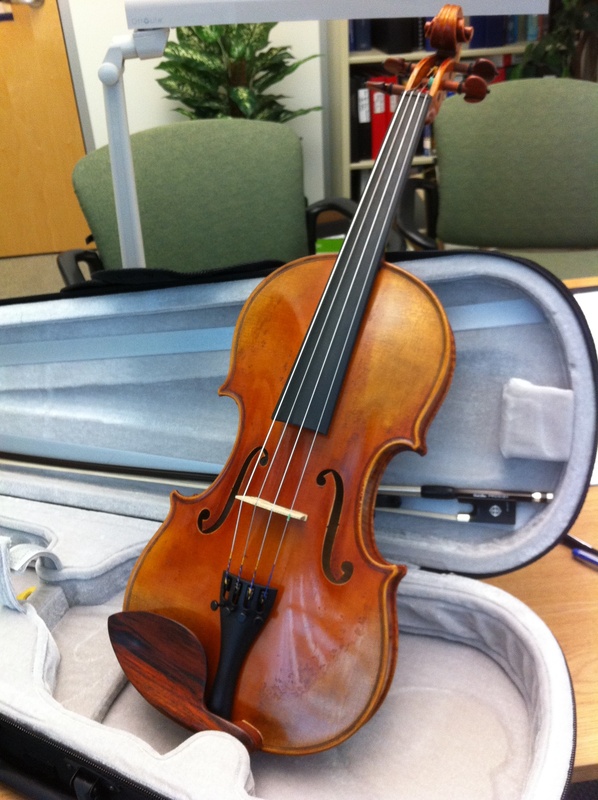 This entry was posted in Fiddlin' Around and tagged Daily life, Fiddle, humor, Music, violin. Bookmark the permalink. Hahahahaha! Musicians can be snobs, just ignore them! Finally, music has the most frustrating step-wise learning curve, don’t let that deter you either! When do we get a concert?? Love it! Even though this has made me NOT want to learn to play the fiddle OR the violin because I simply wouldn’t have the patience, it is a great post. Looking forward to reading more of your journey to fiddle-greatness, and perhaps soon you could post a video of you playing so that we can hear the sweet, crisp sounds coming from your lightly-rosined bow! Good post. You must be getting better – Skunky doesn’t complain anywhere near as much as she did when you first started practising.